Alex Jones’ attorney today argued that “no reasonable reader or listener” would expect that Jones spoke factually on his show, Infowars. 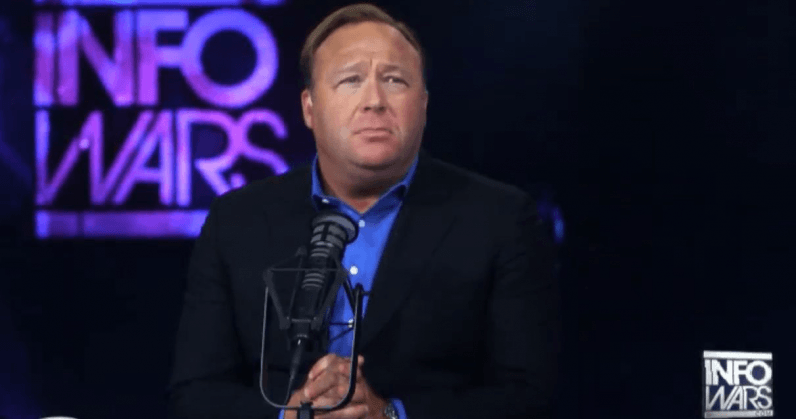 Jones has long been a vocal supporter of the conspiracy theory that the Sandy Hook shooting was faked, an elaborate ruse by anti-gun politicians. He’s repeatedly, and staunchly, parroted the phrase “false flag” when speaking out on the issue. He’s also accused parents of being actors, claiming no children died in the shooting. This is false. Multiple on-scene reports — including those by medical personnel, law enforcement, faculty, parents, and other students — confirm that 20-year-old Adam Lanza fatally shot 20 children between six and seven years old, as well as six adult staff members. These claims are the reason Jones finds himself in court today, his first of multiple pending defamation suits pertaining to comments he’s made about Sandy Hook. Jones, though, finds himself in a bit of a predicament. While Infowars has billed itself as the “lone crusader of truth,” as Texas Monthly put it, Jones’ attorneys are attempting to build a defense around the idea that their client doesn’t really means the words he says — a similar defense to the ones used in his custody case, where his legal team called Jones a “performance artist,” claiming he was playing a character on Infowars. It’s a fine line. Jones’ legal team now finds itself in the precarious position of attempting to convince both the courts and his audience. To his audience, he must maintain that he’s the lone source of truth in a world overrun with dishonest media. Simultaneously, he must convince the courts that his truly odd brand of entertainment is fictional, and that no “reasonable” person would mistake it as factual. One false step and Jones stands to lose millions, either in his viewers who abandon the show after finding out he’s misleading them for profit, or to the families of the victims he’s defamed if courts rule in their favor. In the first of these suits, Jones will try to convince the courts that he’s playing a character, and one that only a fool would take seriously — although one viewer, Lucky Richards, clearly didn’t get the message. Richards was sentenced to five months in prison for stalking, harassing and threatening the lives of Leonard Pozener and Veronique De La Rosa, parents of Noah, a six-year-old boy killed at Sandy Hook Elementary in 2012. Judges, when hearing the Richards case, found the message of Jones so influential in Richards’ decision to carry out the crime that they barred her from tuning into the program once she was released. For those following the case(s), things are about to get really interesting.